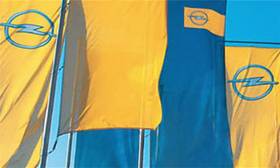 The German government is cautious on state aid for Opel. Opel and the other European operations of U.S. carmaker General Motors have signaled they will unveil a plan for their future next week, German Economy Minister Karl-Theodor zu Guttenberg said on Wednesday. GM says it will consider working with outside investors as it seeks to cut $1.2 billion costs from its European business with a plan that could involve several plant closures or spin offs. As GM Europe's management prepared to hold talks on partnerships or equity stakes, German Chancellor Angela Merkel said GM's German brand Opel must present a clear plan before Berlin could consider state aid. GM has asked Germany for 1.8 billion euros in loan guarantees for Opel. GM said its European business -- which also includes Saab in Sweden and Vauxhall in the UK - would likely post a profit in 2011 at the earliest after significant negative earnings and cash flow in 2009 and 2010. GM Europe President Carl-Peter Forster said: "If it makes sense for the lasting success of GM Europe and Opel, the management is ready to negotiate about partnerships and participation with third parties." GM Europe spokesman Chris Preuss said the company is not ruling out any possibilities to bring money into the business. Third party assistance could include governments providing money in return for stakes in the business. Said Preuss: "We are open to any potential alignments or ideas that would stabilize the business in Europe. Market conditions are not improving and the pressure it is putting on our operations is significant. Time is of the essence here." In a Feb. 17 submission to the U.S. government for emergency funding, GM said it is considering "several" plant closures or spin offs in Europe. The company indicated it is looking at shutting plants in high-cost locations to save cash. The company also says its Saab unit could file for reorganization as early as this month. GM has asked the German, UK, Swedish, Canadian and Thailand governments for $6 billion to help it through its crisis.